The Robert J. Kleberg Public Library is located at the corner of 4th Street and West Henrietta Avenue. Our physical address is 220 North 4th Street, Kingsville, Texas 78363. We are located approximately three minutes away from Historical Downtown Kingsville. The Robert J. Kleberg Public Library is open Tuesday through Friday from 8 a.m. to 6 p.m. and Saturday from 9 a.m. to 1 p.m. We are closed on Sundays and Mondays including City of Kingsville observed holidays, including all Library Board approved closures. Are library cards FREE, and if so, how do I get a library card? Yes - Library cards are FREE to individuals who are residents of Kleberg County. 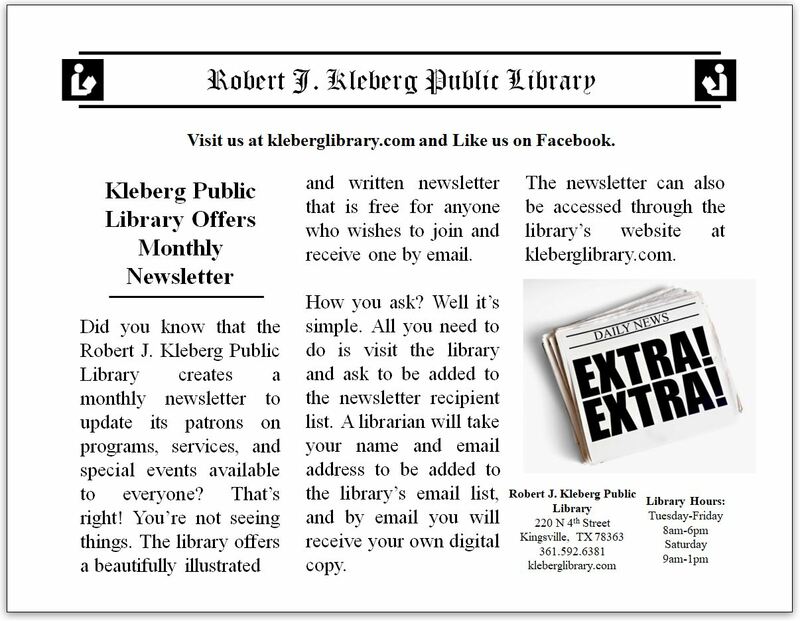 To sign-up for a library card, patrons can stop by the Robert J. Kleberg Public Library during regular business hours and fill out an application. Qualifying residents residing inside Kleberg County are entitled to receive their FIRST card for free. Patrons with lost or misplaced library cards can replace their existing cards for a nonimal fee. PLEASE NOTE: All non-residents, including Winter Texans, applying for a library card must pay an annual $8 non-resident library card fee. Are library cards FREE to Kenedy County residents? Yes - Thanks to the underwriting by the Kenedy County Commissioners' Court, the annual non-resident fee will NOT be charged to any Kenedy County resident signing up for a new library card or updating an existing card. Kenedy County residents ages 5 years and up can enjoy free library services that have been made available by Kenedy County Commissioners' Court for calendar year 2018. Kenedy County residents are eligible for a free card as long as their annual non-resident library card fee has been underwritten by Kenedy County Commissioners' Court. To sign-up for a library card, patrons can stop by the Robert J. Kleberg Public Library during regular business hours and fill out an application. Qualifying residents residing inside Kenedy County are entitled to receive their FIRST card for free. The card will be valid for one full year starting on the date of registration. Patrons with lost or misplaced library cards can replace their existing cards for a nonimal fee. For more information about obtaining or replacing a library card, please call the library at 361.592.6381 during regular business hours. Library card registration to Kenedy County residents is open until December 31, 2018. Are non-resident COLLEGE STUDENTS WHO COMMUTE to Texas A&M University–Kingsville or Coastal Bend College required to pay the $8 Annual Fee for a non-resident library card? Yes – The library considers those students non-residents. HOWEVER, if a college student resides INSIDE the city limits of Kingsville or Kleberg County during their enrollement, the student’s initial library card will be FREE. All college students who reside OUTSIDE the city limits of Kingsville or Kleberg County are considered non-residents and are required to pay the $8 annual fee. Are members of the military and their dependents who reside in Kingsville or Kleberg County eligible for a FREE library card? Yes - As long as the service member and their dependents reside INSIDE the city limits of Kingsville or Kleberg County, the library considers the entire family as residents. The family’s initial library cards will be FREE. Members of the military and their dependents who reside OUTSIDE the city limits of Kingsville or Kleberg County are considered non-residents and are required to pay the $8 annual fee. Do I need to have my library card when I check out materials or use any of the digital services? Yes – To use “library card required” services, patrons will need to have their valid library card. Such services include checking out items from the physical and digital collections, ordering items through the library's Interlibrary Loan Program, signing up for the library's computer labs, the Maker's ZONE Lab, etc. A valid library is required at all times to access "library card required" services. Does the library have a Wi-Fi Hotspot Zone? Yes – The library has a free and open Wi-Fi Hotspot Zone available 7 days a week from 5 a.m. to 9 p.m. that users can access for wireless services. Patrons do not need a library card to utilize this service. The library offers two wireless networks:  The OPEN access Wi-Fi network (does not require registration) and  The SECURE access Wi-Fi network (requires a password which users can obtain at the Circulation Desk). The password is subject to change. In addition, the library also provides Wi-Fi printing services for a nominal fee. Wireless print jobs can be obtained at the Circulation Desk during regular business hours. For more information, please call the library during regular working hours. 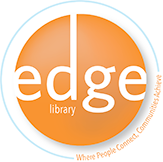 Does the library offer eBooks that can be downloaded to an eReader device? Yes – The library offers not only eBooks, but also audiobooks and streaming videos. 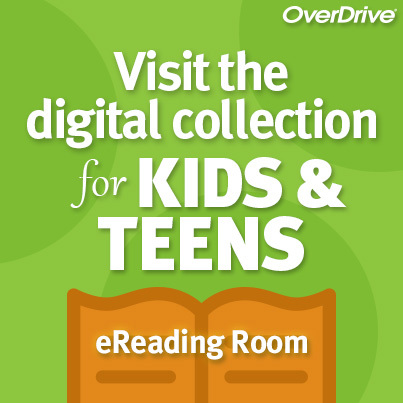 Overdrive® provides and manages the library’s digital collection and services. The library's digital collection provided through Overdrive® are designed to be compatible with electronic devices such as Android-powered smartphones and tablets, iPhone®, iPad®, Nook®, Kindle® and others. Patrons with a valid library card can check out up to six (6) titles. Patrons will never incur any late fees since borrowered items will automatically delete from the patron’s Overdrive® account once the borrowing period has expired. Does the library participate in the TexShare® Card Program? The Robert J. Kleberg Public Library is an active member of the TexShare system libraries, but does not participate in the TexShare® Card Program. For patrons who wish to utilize their TexShare® Card or for those who wish to obtain a new card, patron will have to visit the [ James C. Jernigan Library ] located on the campus of Texas A&M University – Kingsville, 1050 University Boulevard, Kingsville, Texas 78363. You may contact them at 361.593.3416 for more information. Does the library participate in the TexShare® Databases Program? Yes – Registered patrons with a current Robert J. Kleberg Public Library account can access TexShare® Databases from the library’s website at www.kleberglibrary.com. Click on the “eLearning Digital Resources” tab and then select TexShare®: Databases (Requires Password). Patrons can contact the Reference Librarian for the TexShare® ID and password. Does your library offer any special year-round activities for children and adults? Yes - the library offers a number of special events throughout the year for children and adults. The Children's Services Department conducts a weekly storytime for toddlers ages 0 to 5. Toddlers Storytime is held every Thursday morning at 9:00 a.m. The library also offers a summer program which is held annually every June and July that consists of reading programs and group activities. An average of 250 juveniles and teens participate in the weekly activities throughout the summer. In addition, every Novermber during the Ranch Hand Festival, the library holds its "Howdy Authors!" book reading and signing event. The Howdy Authors participants consists of local and surrounding area authors that are invited to discuss and promote their book(s) during the event. In conjunction with Texas A&M University-Kingsville Music Department, the library occasionally holds various student ensembles during the fall and spring semesters. For information of upcoming events, contact the library at 361.592.6381 or visit the library’s website at www.kleberglibrary.com and click on the “Library Happenings” tab. Does your library offer any computer training classes? Yes - The library occassionally offers computer training clases to individuals interested in learning how to use Microsoft Office Software programs. Microsoft Office Software program courses are scheduled based on public demand and funding. Registration is required. For more information, patrons can call the library during regular business hours. Does your library have a bookstore? Yes – The Friends of the Kleberg Public Library Bookstore is located inside the library. The bookstore is open to the public during the library’s regular hours of operation. Vistors that patronize the Bookstore will find a wide selection of new or gently used items such as hardback books, paperbacks, magazines, retro encyclopedia sets, including digital items such as DVDs, CDs, VHS tapes, audio cassettes, and much more. Most items in the bookstore are only 50 cents. Proceeds from the bookstore help fund the puchase of new library books, equipment, including funding special programs and events sponsored by the library. In addition, The Friends’ of the Library conducts a “Silent Auction” every other summer to auction rare books and unique items. For more information about the next Silent Auction, patrons can call the library during regular busniess hours. The Friends of the Library is a non-profit and fundraising organization that provides financial support for vital library programming and services not part of the library's regular fiscal budget. Does the Public Library or Friends of the Library Bookstore accept material donations or financial gifts? Yes – Book donations that are not integrated into the library’s collection are used to stock the Friends of the Kleberg Public Library Bookstore. All new or gently used materials will be accepted. Donors can make arrangements with the library to have their materials picked up. If donors need a record of their donation, they can obtain and fill out the “Gift/Donation Acknowledgment Receipt Form” at the Circulation Desk. The library does not appraise the value of the donated items. Supporters of the Library or Friends of the Library, who wish to make a financial donation by check, can address their financial gift to the appropriate entity of their choice: Robert J. Kleberg Public Library, 220 N. 4th Street, Kingsville, Texas 78363 or Friends of the Kleberg Public Library, P.O. Box 985, Kingsville, Texas 78364-0985. Does the library have a Memorial and Gift Program? Yes – The library gratefully accepts book donations in good condition “in memory or in honor of” someone. Memorial donations made to the library in the form of books or media items are subject to the library’s selection policy. Patrons can also send a financial gift, and the library will select and purchase a suitable book. The donor may specify a subject area, or the library staff will select a book in an area that is in need of new materials. If it is a book donation, the patron fills out the “’Memorial in Memory Of’ Acknowledgment Form.” The library retains the acknowledgement form in its Memorial binder. A bookplate bearing the name of the person being memorialized as well as the name of the donor is placed inside the memorial book. The library displays all memorial books on the Memorial Book Shelf. After a period of one year, books are integrated into the regular collection to accommodate new memorial donations. In addition to books, the library welcomes financial, equipment, and furniture contributions. Patrons who wish to donate equipment or furniture can meet with the Library Director to assess the feasibility of the donation, based on the library’s needs, space, and objectives. The library acknowledges all donations by sending a thank-you card to the donor and an acknowledgment card to the family of the person being honored. What are some of the digital resources the library offers to the public? • LearningExpress Library®: A job, vocational, and school entrance related practice exams database. • Pronunciator®: A fun and free way to learn 80 languages with self-directed lessons, live teachers, and more. • TexShare Databases®: A consortium of 200 plus websites: includes Job Search and Resume Builder. • TexasLawHelp.org: A collection of legal forms available online. • OverDrive®: Contains a digital collection of eBooks, audiobooks and streaming videos. • eReady Reference Resources: A listing of informational websites made available by Reference Staff for research use. PLEASE NOTE: These resources are available for easy access anytime, day or night. Patrons accessing the library’s website can click on the “eLearning Digital Resources” tab to utilize the digital resources listed above. While the public library makes available several online resources via the INTERNET, some library digital services require the patron to have a valid library card to access the service. Patron's account must be in good standing with the Robert J. Kleberg Public Library in order to access "library card required" digital resources.